Monday’s bombing at the finish line of the Boston Marathon on Patriots’ Day propelled America back to a 9/11 mindset. Tuesday through Thursday were pre-occupied with grief, manhunts and memorial services. Poisonous envelopes mailed to the president and two US senators, along with a massive explosion at a fertilizer plant in Texas, only added to the low hum of anxiety. It was “a tough week,” as President Obama said in a post-arrest press conference at the White House. But we emerged stronger, if sadder, and more united as a result of all we had experienced..
Twelve years after 9/11 we remain a transformed nation, for better and for worse. This was the first terror attack on American soil targeting civilians since 2001 – a record that is the result of both hard work and good luck. More than 45 jihadist plots have been foiled in the interim. But after the attacks of 9/11, when I was working as chief speechwriter to Mayor Rudy Giuliani, America benefitted from “the warm courage of national unity” – a phrase that George W. Bush borrowed from FDR. This time around, the rot of hyper-partisanship, fueled by social media, led to a flury of polarized finger-pointing after the attack. So liberal commentator David Sirota penned a piece called “Let’s Hope the Boston Marathon Bomber is a White American”, conservative Congressmen Steve King tried to use the attack as an excuse to delay immigration reform. Hyper-partisans were actually hoping that the bombers’ identity would help prove their preferred political point. In the end, the apparent identity of the terrorists was something more complex, outside the too simple divides of black and white. The two brothers accused of the attack – Tamerlan and Dzhokhar Tsarnaev – were ethnic Chechens who immigrated from Russia. According to reports, the younger brother Dzhokhar became a U.S. citizen on September 12, 2012. The older brother, Tamerlan – age 26 – had apparently been under FBI surveillance in the past. His You Tube playlist included links to rants by an al-Qaeda sympathizing Australian fundamentalist preacher named Feiz Mohammad, who also railed against the alleged evils of Harry Potter. But the younger brother Dzhokhar, 19, now in custody, seems to have been only recently radicalised under the influence of his older brother. His classmates at University of Massachusetts told CNN’s Chris Lawrence that “they’d “never heard any political statements from him.” On the day of the Boston bombing, Dzhokhar Tweeted out a Jay-Z lyric, “ain’t no love in the heart of the city, stay safe people.” But he had also apparently previously Tweeted out sympathies for 9/11 conspiracy theories – never a good sign of sanity. 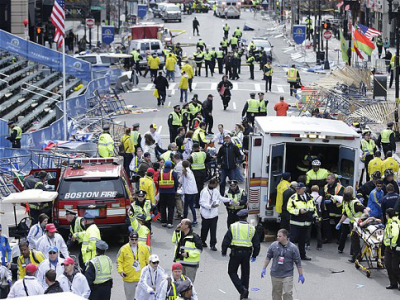 In the wake of the marathon attack, thousands of law enforcement officials descended on Boston. Their search eventually focused on the two brothers thanks to a bittersweet post-9/11 innovation – the now near-omnipresent video cameras in urban areas, which caught images of the brothers along the route. The big break in the case came late Thursday night when the two brothers robbed a MIT-area 7/11 and murdered of a 26-year old university security officer, bringing their total murder toll to 4 and more than 170 injured. A subsequent firefight with police led to the killing of Tamerlan, who had rigged his body with explosives, and the brief flight of Dzhokhar, who was found after a massive manhunt, hiding in the hull of a boat stored in the backyard of a middle class home in the suburb of Watertown. “I love this country that gives opportunity to everyone,” Ruslan continued, offering his heartfelt apologies to the victims of the attack: “I’m ready to kneel in front of them and ask for their forgiveness.” This is the kind of voice that reaffirms national unity. Finally, this week there was ample evidence of a larger lesson learned after 9/11 – the importance of resilience. People in Boston and across the nation went to work and travelled the day the day after the attacks. The ultimate aim of terrorism – to change free people’s behavior through fear – utterly failed. The defiant persistence of daily life remains the most powerful repudiation of terrorism. Courage is the indispensible quality in a democracy. Wanted: Dead or Alive still applies in America, but the greatest sign of civilization is the determination to move forward – because free people refuse to live in fear. In the end, the apparent identity of the terrorists was something more complex, outside the simple divides of black and white. The two brothers accused of the attack – Tamerlan and Dzhokhar Tsarnaev – were ethnic Chechens who immigrated from Russia. According to reports, the younger brother Dzhokhar became a U.S. citizen on September 12, 2012. The younger brother Dzhokhar, 19, now in custody, seems to have been only recently radicalised under the influence of his older brother. His classmates at University of Massachusetts told CNN’s Chris Lawrence that “they’d “never heard any political statements from him.” But he had also apparently previously Tweeted out sympathies for 9/11 conspiracy theories – never a good sign of sanity. This entry was posted in Columns, Featured Columns and tagged 2008 Elections, National Security, New York, The Resilient City, The Telegraph. Bookmark the permalink.